International genetic research, headed by the UW, aims to prevent widening disparities in future access to precision medicine-era treatment of Parkinson's disease in the Latino population. Ignacio Fernandez Mata has just returned home from Bogotá, Colombia to his neurogenetics lab at the University of Washington. He’s been to different countries all across South America, such as Argentina, Brazil, and Peru. Mata will soon travel to Uruguay and Ecuador to continue his work at the research sites participating in the first large-scale study on the genetics of Parkinson's disease in the Latino population. The identification of genetic risk factors for Parkinson's disease has revolutionized the medical research field, helping researchers to identify novel biological targets for Parkinson's therapies. These advances also promise to make clinical trials more effective by allowing enrollment criteria to be based on a person's genetic profile. However, the Latino population, who will comprise 22% of the US population by 2050, may confront barriers to these future opportunities. To date, genome-wide association studies have found over 30 genetic risk factors for Parkinson's disease, but the vast majority of this research has been conducted in Caucasian subjects of European descent. Human DNA varies between ethnic groups or geographic regions. Mata has found that many genetic risk factors for Parkinson's disease common in Europeans appear to be rare in Latino populations, suggesting that unknown variants underlie at least some of their disease risk. Latinos experience slightly higher rates of the disease as other ethnic groups. Mata and collaborators are now working to find novel genetic risk factors for Parkinson's disease in the Latino population and increase knowledge and awareness of this condition. 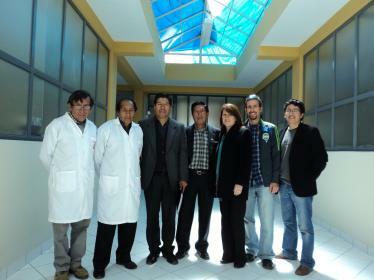 With the help of a Parkinson’s Disease Foundation (PDF) grant in 2009, Mata created the Latin American Research Consortium on the Genetics of Parkinson Disease (LARGE-PD), a collaboration between the UW/VAPSHCS and investigators at nine institutions in South America. The work has generated the world's largest Parkinson case-controlled study cohort of Latinos and a DNA collection from over 4,000 subjects. With a lack of funding in intervening years, Mata has had to make every dollar and partnership count. Building his study in South America instead of the U.S. has made it much easier to recruit participants and affected families of Latino descent, mainly from local neurology clinics. And, money goes a lot farther in South America for the resources and personnel needed to run the research sites and genetic collection protocols. But now, a new junior faculty award of $300,000 from the PDF gives Mata’s team the green light to mine the treasure trove of data. The LARGE-PD consortium will apply new forms of genetic technology and biostatistical methods designed to detect genetic risk factors in ancestrally diverse populations. Such tools have been made possible by large genetic projects such as the HapMap project and, more recently, the 1000 Genomes Project Consortium, which created the largest catalog so far of genetic variation in the human genome from people in 26 population groups around the globe in 2015. This and similar advances have led to reference genomes for comparing the genetic make-up of individuals in non-European population groups. Mata’s team will use the MEGA Chip, Illumina’s multi-ethnic genotyping array, to identify the different gene variants present in the genomes of his Latino study participants. Then, the analysis starts as Dr. Timothy O’Connor, Assistant Professor of Medicine at the University of Maryland and Dr. Timothy Thornton, Associate Professor in the UW Department of Biostatistics lend their expertise in statistical methods to identify genetic factors associated with Parkinson's disease in Latinos. Dr. Thornton has used these techniques with success in studies of asthma, diabetes, and sleep apnea in Latino cohorts in the US. Thornton's approach is suited to the diverse nature of the Latino genome. Latinos carry a mixture of DNA from three distinct ancestries: indigenous American (of South and Central America, Mexico, and the Caribbean islands, referred to as “Amerindian”), European as a result of colonization, and African as a result of slave transport from West Africa. He uses a newly developed algorithm that can sort through the genome and divide the gene variants into the three groups of ancestry. Then, in reference to a control population without Parkinson disease, the team can search for variants associated with the disease in one ancestry at a time, or in all of the ancestries at once. These methods help them to determine how the gene variants affect the probability that someone of a certain ethnicity would develop symptoms. * Cover image: LARGE-PD researchers talk with an indigenous Peruvian population about the research being done thanks to their contributions. 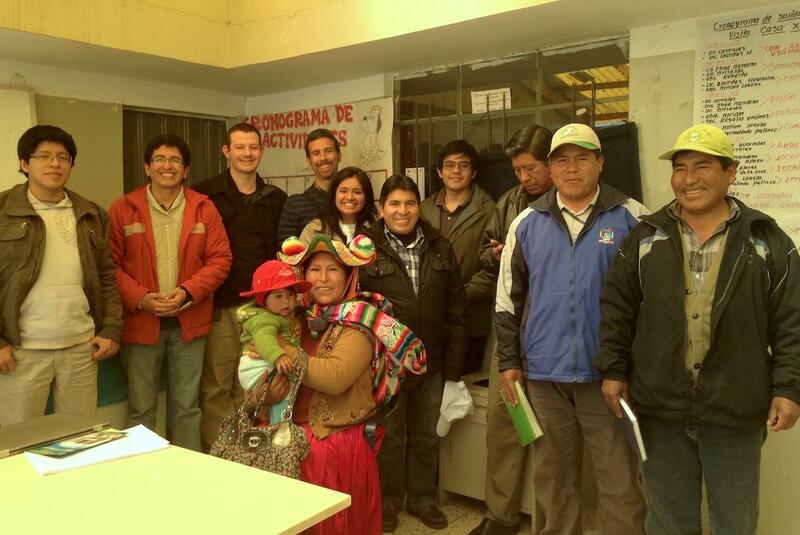 They are meeting in a hospital outside of Puno, Peru, near Lake Titikaka. If we don’t know more about common risk variants in this population, we won’t be able to offer them the right care, useful genetic counseling and testing services, or opportunities to enroll in future precision medicine clinical trials.